It isn't often I put up guest posts on this blog; come to think of it, I don't think I've ever done it. However, long time cryptid and general anomaly researcher, Ulrich Magin got in touch with me about new information he had found on the Loch Morar Monster, also known as Morag (or Mhorag). Ulrich is known in Loch Ness Monster research circles from decades back. In fact, by coincidence, I recently found a letter he wrote to me back in the 1980s concerning Scottish sea serpents. Amongst the various articles and books he has written, he is to be thanked for the prodigious task he undertook as a youth of going over to Scotland to find and collate the hundreds of Nessie reports from the Inverness Courier and other papers. In fact, he didn't start at 1933, but went back into the 19th century to find the 1852 account of kelpies, ponies and somewhat concerned natives. You can find his list of sightings in Henry Bauer's "The Enigma of Loch Ness". Going back to Mhorag, these are mainly pre-1933 Nessie era stories which range from the mythical to something more in keeping with the format of modern reports.So, without further ado, I hand you over to Ulrich. The monster, or mermaid, of Loch Morar was news long before its cousin from Loch Ness hit the headlines. 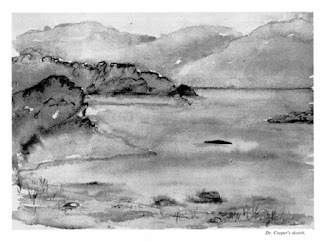 I have fond personal memories of a bed & breakfast at Morar where I stayed in 1980, only to be lent the first book to ever mention the creature, James Macdonald’s “Tales of the Highlands” which contained an encounter between its author and a mermaid or monster-like creature in Loch Morar in 1887. The landlady said it was the very same copy Elizabeth Montgomery Campbell had used, the lady who wrote “The search for Morag”. I was still a schoolchild then, and when I returned, my parents urged me to send the valuable book back. When I visited Morar for the second time in 1981, the lady who had lent the book to me had died, and her children had thrown it away. I only hope there are further copies out there. James Macdonald said Morag was a mermaid who only appeared when members of a certain family died. That is the siren of ancient lore, yet when he himself encountered Morag he gave no description at all. Still, mermaids were sometimes seen in Scottish lochs. “Morag is always seen before a death and before a drowning. There is a creature in Loch Morar and she is called Morag. She is never seen save when one of the hereditary people of the place dies. The last time she was seen was when Aeneas Macdonnell died in 1898. The Morag is peculiar to Loch Morar. She is seen in broad daylight and by many persons, including church persons. She appears in a black heap or ball slowing and deliberately rising in the water and moving along like a boat water-logged. The Morag is much disliked and is called by many uncomplimentary terms. Here, Morag is still part-time mermaid, part-time monster. Loch Morar became news globally when it was found that the lake was of immense depths. “The survey of the fresh-water lakes of the United Kingdom which is now in progress, under the superintendence of Sir John Murray, reveals the fact that Loch Morar, in Inverness-shire, is the deepest lake in the kingdom. We come across Morag again in the first decade of the 20th century, with three reports, all of them about a monster. The first is from a novel, Ethel Forster Heddle‘s The secret of the Turret, published by Sir Isaac Pitman in 1905. The book has 229 pages; the quote is on p.56. The characters discuss Scottish folklore. “THE SECRET OF THE TURRET. By Ethel Heddle. London: Sir Isaac Pitman and Sons. This is precisely the style of story one expects to find eagerly followed through the weekly pages of such journals as Forget-me-not, Home Notes, and others of a similar class. It is the story of a charming girl - they always are charming; an American heiress and orphan - they are always heiresses, these Americans, - and her stay in a romantic castle in the Highlands of Scotland. All the proper accessories to a modem mystery are considered, glibly grafted on to the stage properties of the earlier romance, so that the ‘Secret of the Turret’ may lack nothing in the way of accessories. But ‘the kilts’ are the real ‘piece de resistance’ of the picturesque attractions! The crumbling stair and narrow plank which lead to the turret room; the stormy loch, with its ‘sea horses’; the old bell with its, quaint inscribed instructions to the traveller — these are all the well-worn, threadbare accessories, but the kilts - new kilts, worn kilts, dress kilts, kilts of all sorts, these are the everyday interpreters of romance!" Still in 1908, the monster is mentioned in William T. Kilgour’s "Lochaber in War & Peace: being a record of historical incidents, legends, traditions & folk-lore with notes on the topography & scenic beauties of the whole district". (Gardner, 1908, p.173–174). Morag here still announces local deaths, but she is transformed into a version of the kraken or island beast, much closer to what we would expect from a lake monster. “Scottish Monster Sighted On Loch.